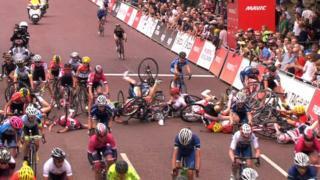 Barbara Guarischi wins the Prudential RideLondon Grand Prix after a massive crash decimates the field in St James's Park. The Velocio Sports rider benefitted from a strong lead out before launching a perfect sprint for the line. The 2013 winner Laura Trott, who finished eighth, described the sprint as "just too fast". Follow the RideLondon events on the BBC.